This is the second of two performances by LDG in the intimacy of the 4MBS Performance Studio. 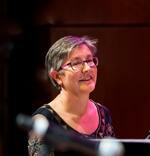 The trio will perform Louise's recent compositions as well as rarely heard songs from her back catalogue. The compositions feature Louise's signature lyrical melodies, rich harmony and strong grooves. “…[Denson’s compositions] are not just improvising vehicles, they are pieces, which, with their rhythmic momentum and attractive chord changes, all but ensure that strong improvisations emerge…” John Shand, Limelight Magazine.